Today I’m teaming up with Trunk Club again and this time we are talking all about tricky Fall Transition. Fall can definitely be a trap here in TX because it’s cool in the mornings but my noon you’re sweating through your layers. 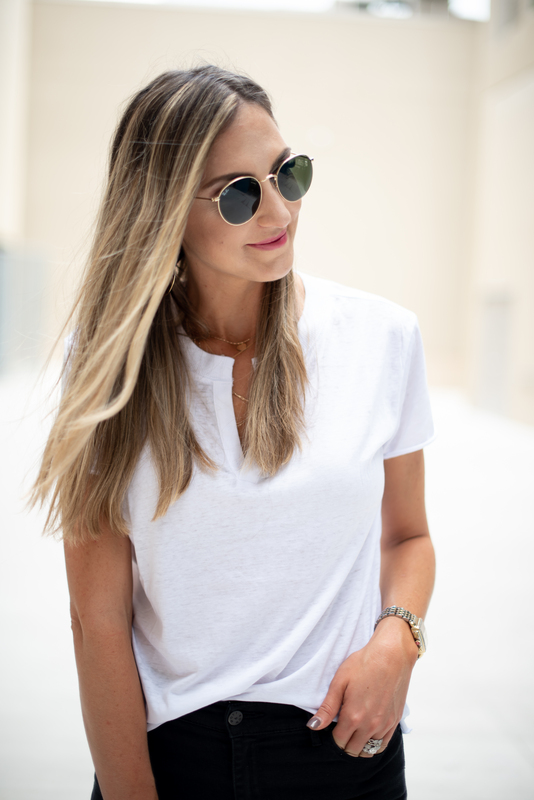 Finding tops to accommodate can be hard and that’s why I turned to my Trunk Club stylist, Bianca, to set me up with a few really functional Fall transition tops that are appropriate for Texas weather and my current #momlife. She totally nailed this Trunk and I ended up not only keeping several of the tops, but she surprised me with a fashion shoe that I absolutely fell in LOVE with and kept as well (see below). This is what I love about Trunk Club, you always get what you ask for AND my stylist always sends me at least one piece that takes me out of my comfort zone. On top of that you can completely customize your Trunk if you wish. For example, if you want ONLY transition tops, that’s what you’ll get. Need a few new pairs of jeans for Fall? Simply request a Trunk full of Fall denim that you can try on at home. This is a total win! The question is can you ever have enough great white tees?! I think not. This one had a great fit, soft hand and a cool split neck, which made it different from any other white tees that I currently have. It was a fabulous price and I decided to keep it because some days during the odd weather days of Fall, it’s simply a great default to reach for a white tee and jeans! Definitely a perfect addition to my Fall Transition Trunk! This top is an absolute essential for everyone this season and perfect for this Fall Transition Trunk. Flattering and functional on nearly any body type and light weight enough to get you through transition as well as through Fall with layers over it. Such a cute top to wear with a bralette peaking out and style up with accessories or simply throw it on with jeans and sneakers. A great Fall top that has an even better price point and is totally functional for my everyday life! This top was by far my favorite from the entire Trunk and I can’t say I really expected it to be. I’d seen it a dozen times before on Nordstrom’s website, but it never really caught my attention…until I tried it on. It’s a wonderful relaxed fit with just enough details (notched collar and buttons up the back) to make you feel polished and put together. I’ve since worn it probably a dozen times and feel confident and pulled together in it, even though it’s under $50 and more of a relaxed fit. I’m SO glad that this came in my Trunk because otherwise I may have never tried it! Next up were a few fashion pieces! 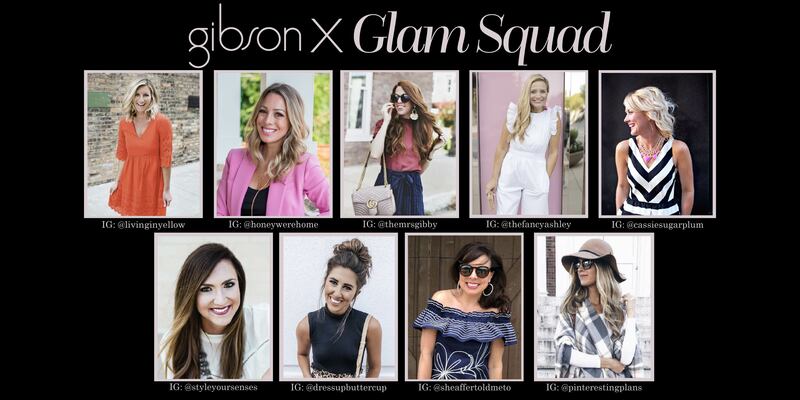 I did ask my Trunk Club stylist, Bianca, to surprise me with a few fashion pieces, in hopes of finding a few things that I may have otherwise overlooked. Well, she nailed it! First up is this waterfall vest that’s uber flattering and great for layering now AND later. While it’s still warm, I’m wearing it over a long tank, with black skinnies and booties. It’s a chic look that reads Fall, but isn’t overwhelmingly warm. As the weather cools, you could easily swap out the tank for a long sleeve top, lightweight sweater or even dress it up with a black bodysuit. Bianca (my Trunk Club stylist) also sent this neutral clutch that was exactly what I needed! It’s a super soft leather and totally captures the racing stripe trend happening now. It’s a fun piece to carry, but neutral enough to go back to nearly any Fall outfit. 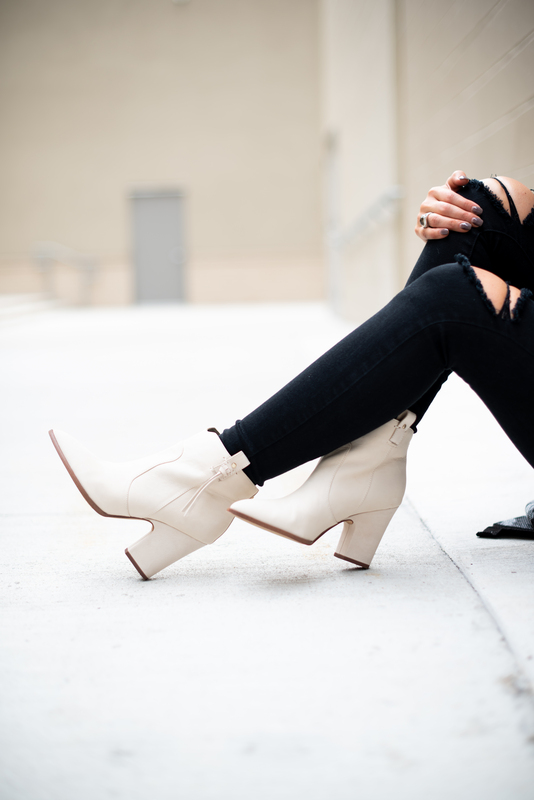 Last (BUT CERTAINLY NOT LEAST) she sent these KILLER off-white leather booties. I have been hesitant to go for the white boot trend, but these actually stopped me in my tracks in the store a few weeks back. They are the perfect creamy shade of white and look a little Western (which is so hot for Fall). When I opened my Trunk with these inside, I knew that it was a sign that they were meant to be mine! 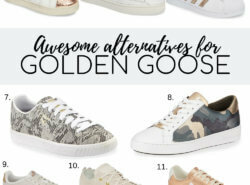 I’ve LOVED styling them out and have found them to be easy to wear and a great trend piece that’s easier than I expected to work into my closet! I’ve truly loved sharing my Trunks with you each quarter and I think that this one might be the best yet, don’t you? All of the pieces were so tailored to my specific lifestyle and I really did find some winners, without ever having to leave the comfort of my home! Other benefits of Trunk Club are that they are a Nordstrom Company and carry lots of the same merchandise for your stylist to select from. Your stylist can also work with your existing pieces and curate a trunk with suitable layers that might work. The options are really endless!!! Click HERE to sign up. *This post was sponsored by Trunk Club, all opinions and remain my own. As always, thank you for supporting brands that believe in Style Your Senses.